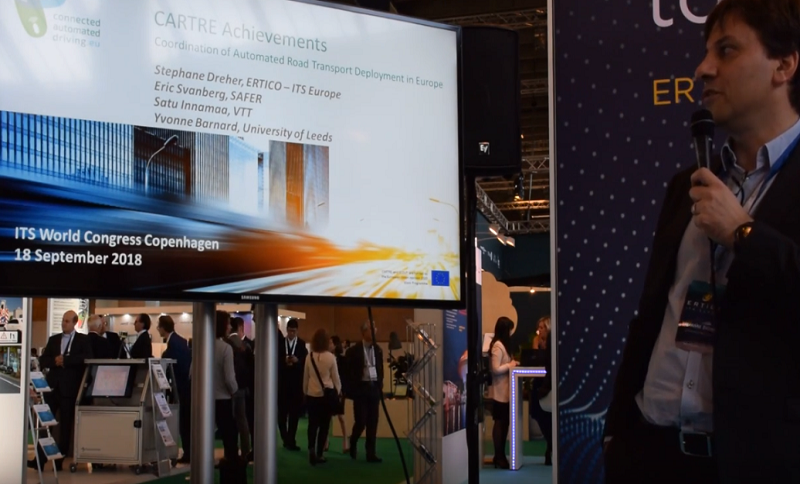 The ITS World Congress 2018, which took place from 17-21 September in Copenhagen, provided the ideal opportunity for the Connected Automated Driving (CAD) initiative to engage with professionals of the ITS sector and to increase its visibility among international stakeholders. During the five days’ Congress, CAD coordinated topic-related meetings and workshops and supported the different sessions on connected and automated driving. One of the main activities lead by CAD was the ‘FOT-Net International Workshop: Strategies for sharing data and knowledge’ held on 17 September and was jointly organised by CARTRE and FOT-Net. FOT-Net is a networking platform for stakeholders interested in Field Operational Tests (FOTs) that has been actively working with CARTRE during 2017-2018. The half-day workshop was a meeting point for stakeholders to discuss how to further develop the knowledge base and the handling and sharing of data required for connected automated vehicle pilots. Further discussions included broad debates about the role of policy and funding to promote data provision, the impact of automation and the sharing of the knowledge base. Last but not least, the CARTRE project presented its data sharing strategy and the lessons learned. Besides, the Congress’s exhibition space was an excellent opportunity to present CAD to stakeholder interested in connected automated driving. CAD was showcased at the ERTRAC and the ERTICO booth where relevant communication material was displayed, including the final edition of the CAD newsletter. On 18 September, CARTRE partner ERTICO ITS Europe coordinated a dedicated session to present some of the results of the CARTRE project that came to its end in October 2018. During this session, coordinator Stéphane Dreher, from ERTICO ITS Europe introduced the session, highlighting the contribution done by STRIA and ERTRAC during the two years project. Eric Svanberg from SAFER, one of the CARTRE partners, presented the status of the data sharing and data exchange platform developed within CARTRE. The session had also the contribution of Satu Innamaa from VTT who presented the trilateral high-level impact assessment framework and Yvonne Barnard from the University of Leeds who introduced the FESTA handbook.